Microsoft RichCopy is a tool I discovered when I made the jump to Windows 7 and wanted to maintain direct file based backups of my data as opposed to using Windows backup or other backup tools and software. This allows for real time reference, comparison and restores – a poor mans version control of sorts for web site files and general documents – a live version on production servers, a development copy on my dev workstation, a “live” nightly copy of that on a second physical disk on my workstation (instant reference for those %*&*! moments) , and a weekly clone of that on a local server. Hey, it works! I recently upgraded to Windows 7 and modified my trusty old Robocopy scripts to hit all the new data locations and “Libraries” which 7 brings to the table. Using Robocopy I was copying 120 gigs of data to a freshly formatted 200gig disk and the process would die because the disk was running out of space. What the heck! I tried twice with a freshly formatted destination disk and both times no luck. I checked two processes which can generate “hidden” data – System Restore and Volume Shadow Copy service. Showing all hidden and system files showed nothing on my backup drive, not even a recycle bin (freshly formatted disk). Obviously on a brand new disk and system there should be little to no Restore or Shadow Copy data but somehow data was coming over with the copy. It was interesting to learn about these Windows 7 features so here’s a little about that. I turned System Restore off deleting all restore points (not much on a new system). I checked Volume Shadow Copy Services using VSSADMIN there was no Copy for my D: drive and only 400meg for my C: drive. I deleted all Shadow Copies. 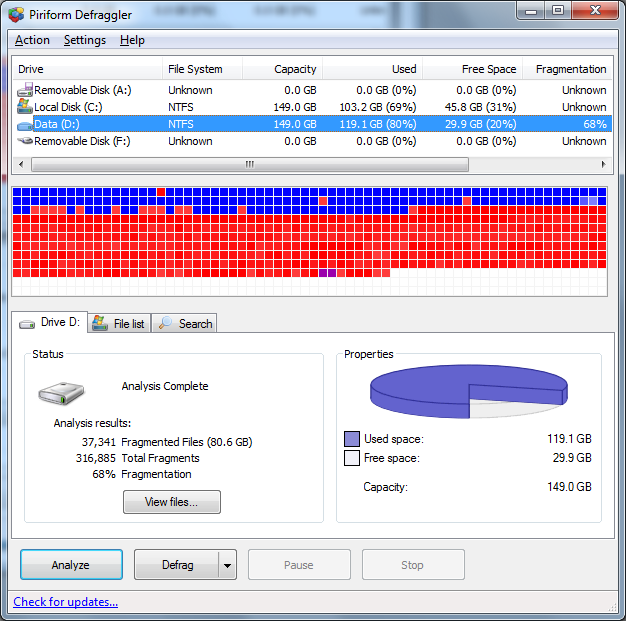 Thus eliminating a common reason disks fill up without showing where the data is. After deleting System Restore Points and Deleting Volume Shadow Copies I was still stuck – Explorer showed that I had 124gigs of data, but Robocopy was filling a 200gig disk before it was 75% complete. I hit the web for alternate file copy methods and landed on Richcopy. If anyone has thoughts as to what could be causing this massive file growth let me know! I would call Richcopy Robocopy with a powerful GUI. I fired up Richcopy and liked what I saw, my probelm was how to schedule it. This excellent post on the Symantec site to the rescue – “How to Replicate File Shares Using Microsoft RichCopy“. I tested a Scheduled backup using the method posted at Symantec and boom I was good. But… one huge problem – 68% fragmentation. sixty six. whoa. My guess this is from the Multithreading feature of Richcopy – I used the default of 3 threads. This was very suprising as I had a freshly formatted disk and expected to see little to no fragmentation. I’ve been using Richcopy a few weeks no and am backing all the PC’s in my house over the LAN. So far so good with the initial fragmentation issue not as major once the primary copy completes. Copy Options – When I choose a subfolder of “Application Data” in XP or “AppData” in Windows 7 Richcopy returns either a single letter like “R” or what appears to be Chinese text. Fragmentation – 68% on a freshly formated disk – whoa. I haven’t confirmed but my guess is settings threads to 1 may help here? All in all Richcopy looks like a good solution save for the two issues listed above. What are you using for file copy? Anyone have thoughts on my unexplained file growth with Robocopy? Have anyone really tested this utility. Whenever I create a profile and do a save as and I go to open the profile later, none of my data is there. Beware if so called great utilities that have no supporty and no QA to speak of. Has anyone tried it in windows 7? Because it looks good mean exactly nothing without support and good QA. Trying RichCopy 4.0.217.0 on x64 win7ult to mirror (purge) portions of three 2TB drives to 4th 2TB drive on one computer. I want directory time and date copied and some directories and files excluded. (The requirement to copy directory timestamps eliminates most Windows 7 backup products i have tried so far.) RichCopy does a good job of not copying hidden, system, etc., directories when requested to do so. During tests the required directories/files are copied. But directories/folders that have been deleted in the source remain intact at the target, in spite of specifying ‘method’ as ‘purge’. My testing of ‘exclude’ directories is far from comprehensive. Exclude files works as expected when using such strings as ‘*.avi’. Information on the structure of strings in the ‘Condition to Exclude Directories’ field in Options is hard to find. Experiments have been less than fruitful. If anyone can suggest x64 Win7 GUI backup software that will satisfy these requirements, I’d be most grateful.